We know that creative licenses can be complex. Creative Specks aims to offer you maximum creative flexibility with minimal complexity. This license applies to all downloadable paid items. Use any item for personal and commercial use in unlimited projects. Installable items such as fonts and add-ons may be installed on a single computer. You can purchase the license for yourself or on behalf of a customer. Fonts & graphics may be printed on to unlimited products that are subsequently sold or distributed; However, the digital font files must NOT be included in the sale of this product, or distributed for free afterwards. Items cannot be included (even for free) in the sale of another item. For example, the inclusion of the original svg file when selling a customized cup. Items that have been digitized cannot be sold as individual files. For example, if you digitize a font for embroidery you cannot sell it as an embroidery font. You can however create a design with the items purchased (either written or graphics) and sell that as an embroidery file. 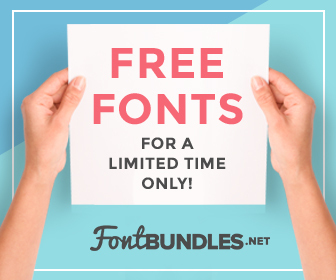 If you need to distribute the files to a client, for example a font when you created a logo, you or the client can purchase the bundle again. If the bundle is not available anymore contact us and we will provide you with the necessary details.